Aomori Prefecture (青森県, Aomori-ken) is a prefecture of Japan located in the Tōhoku region. The capital is the city of Aomori. Until the Meiji Restoration, the area of Aomori prefecture was known as the northern part of Mutsu Province. During the Edo period the Hirosaki clan began building a seaport at the current city of Aomori. There were green woods near the city which were used as landmarks for the ships that came into port. These green woods called aoi-mori is where Aomori got its name. The prefecture came into existence in 1871. The town of Aomori was established in 1889. The town was incorporated as a city in 1898 with a population of 28,000. On May 3, 1910 a fire broke out in the Yasukata district. Fanned by strong winds, the fire quickly devastated the whole city. The conflagration claimed 26 lives and injured a further 160 residents. It destroyed 5,246 houses and burnt 19 storage sheds and 157 warehouses. At 10:30 p.m. on July 28, 1945 a squadron of American B29 bombers bombed over 90% of the city. Radio Aomori (RAB) made its first broadcast in 1951. Four years later, the first fish auctions were held. 1958 saw the completion of the Municipal Fish Market as well as the opening of the Citizen's Hospital. In the same year, the Tsugaru Line established a rail connection with Minmaya Village at the tip of the peninsula. Various outlying towns and villages were incorporated into the growing city and with the absorption of Nonai Village in 1962, Aomori became the largest city in the prefecture. In March 1985, after 23 years of labor and a financial investment of 700 billion yen, the Seikan Tunnel finally linked the islands of Honshū and Hokkaidō, thereby becoming the longest tunnel of its kind in the world. Almost exactly three years later, on March 13, railroad service was inaugurated on the Tsugaru Kaikyo Line. That same day saw the end of the Seikan Ferry service. During their 80 years of service, the familiar ferries of the Seikan line sailed between Aomori and Hakodate some 720,000 times, carrying 160 million passengers. In April 1993, Aomori Public College opened. In August 1994, Aomori City made an "Education, Culture and Friendship Exchange Pact" with Kecskemet in Hungary. One year later a similar treaty was signed with Pyongtaek in South Korea, and cultural exchange activities began with exchanges of woodblock prints and paintings. In April 1995, Aomori Airport began offering regular international air service to Seoul, South Korea, and Khabarovsk, Russia. In June 2007, four North Korean defectors reached Aomori Prefecture, after having been at sea for six days, marking the second known case ever where defectors have successfully reached Japan by boat. In March 2011, a magnitude 9.0 earthquake struck Japan on the east coast. The northeastern coast of Aomori Prefecture was affected by the resulting tsunami. Buildings along harbors were damaged along with boats thrown about in the streets. Aomori prefecture’s climate is cool for the most part. It has four distinct seasons with an average temperature of 10°C. Variations in climate exist between the eastern (Pacific Ocean side) and the western (Japan Sea side) parts of the prefecture. This is in part due to the Ou Mountains that run north to south and divide the two regions. The western side is subject to heavy monsoons and little sunshine which results in heavy snowfall during the winter. The eastern side receives little sunlight during the summer months, June through August, with temperatures staying relatively low. The lowest recorded temperature during the winter is -9.3°C, and the highest recorded temperature during the summer is 33.1°C. Aomori Prefecture is the northernmost prefecture on Honshu and faces Hokkaido across the Tsugaru Strait. 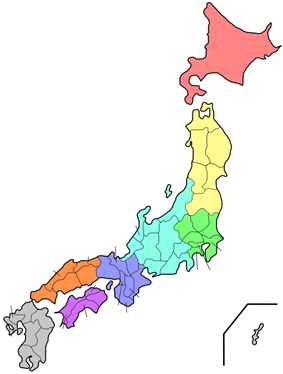 It borders Akita and Iwate in the south. Oma, at the northwestern tip of the axe-shaped Shimokita Peninsula, is the northernmost point of Honshu. The Shimokita and Tsugaru Peninsulas enclose Mutsu Bay. Between those peninsulas lies the Natsudomari Peninsula, the northern end of the Ōu Mountains. The three peninsulas are prominently visible in the prefecture's symbol, a stylized map. 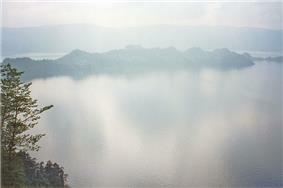 Lake Towada, a crater lake, straddles Aomori's boundary with Akita. Oirase River flows easterly from Lake Towada. The Shirakami Mountains are located in eastern Aomori and contain the last of the virgin beech tree forest which is home to over 87 species of birds. As of April 1, 2012, 12% of the total land area of the prefecture was designated as Natural Parks, namely Towada-Hachimantai National Park; Shimokita Hantō and Tsugaru Quasi-National Parks; and Akaishi Keiryū Anmon no Taki, Asamushi-Natsudomari, Ashino Chishōgun, Iwaki Kōgen, Kuroishi Onsenkyō, Nakuidake, Ōwani Ikarigaseki Onsenkyō, and Tanesashi Kaigan Hashikamidake Prefectural Natural Parks. Aomori Prefecture is host to the Misawa Air Base, the only combined, joint U.S. service installation in the western Pacific servicing Army, Navy, and Air Force, as well as the Japan Self-Defense Forces. Like much of the Tōhoku Region, Aomori Prefecture remains dominated by traditional industries such as farming, forestry, and fishing. Aomori Prefecture is Japan's largest producer of apples. Aomori is well known for its tradition of Tsugaru-jamisen, a virtuosic style of shamisen playing. There are two airports located within the Aomori Prefecture. Both airports are relatively small, offering international flights to Korea, as well as domestic flights. The following major stations are located in Aomori Prefecture. The following lines, operated by East Japan Railway Company (JR East), run through Aomori Prefecture. Aomori Shōwa Daibutsu (昭和大仏), also known as the Big Buddha in Aomori, is the tallest seated Buddha in Japan. Located at Seiryuu-ji Temple (Blue-Green Dragon Temple) in Aomori City, this statue was built as a symbol of gratitude for WWII soldiers as well as a symbol for Buddha’s teachings. The Seiryuu-ji temple itself is relatively new and was founded in 1982 by a priest named Ryuko Oda. The temple grounds have traditional style Japanese architecture. In 1984 the Big Buddha statue was built, weighing in at 220 tons and is 21.35 metres (70.0 ft) tall. Underneath the Buddha there is a circular hallway with many paintings, pictures and small statues. A Buddha shrine with an offering table can also be found inside. Located in Nanbu town, this temple houses the oldest Buddha ashes in Japan. In addition it has the largest three-story pagoda in Japan and a thousand-year-old cedar tree. 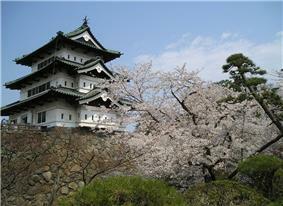 Hirosaki Castle, a castle in Hirosaki known for its gardens' cherry blossoms. Wild horses can be seen at Cape Shiriya and Shipwreck Beach. 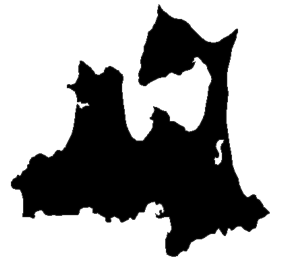 The peninsula that forms the bay is known as Shimokita Peninsula or "The Hatchet". There is a localized Japanese legend that Jesus Christ did not die on the cross but made his way to Shingō, Aomori where he became a rice farmer, married, and had a family. The legend owes its existence to a supposed 1930s discovery of what were claimed to be "ancient Hebrew documents detailing Jesus's life and death in Japan". 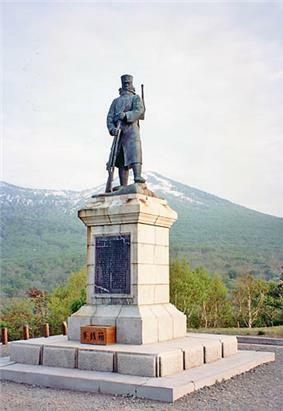 The legend also claims that his grave is located in Aomori. This legend, and the documents it originated from have largely been dismissed as a hoax, but the tourist attraction still persists, along with a traditional song and dance to placate the spirit of Jesus. The meaning of the song though has been lost over time. Located near Fukaura Town, the name means “twelve lakes” despite the fact that there are 33. One unique characteristic is the lakes' brilliant colors; one in particular, Aoike Lake, is a rich blue color. Lake Towada, a caldera, lies on the boundary between Akita and Aomori Prefectures. During the summer, firework displays light up the sky and reflect off the water offering a spectacular show. 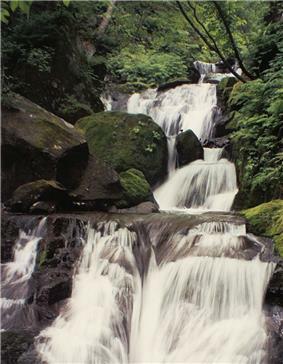 Oirase Gorge lies near Lake Towada and is a popular location for hiking. 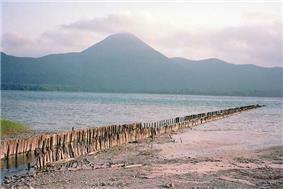 Mount Osore, the Mountain of Dread, is near Mutsu on the Shimokita Peninsula. This is one of three mountains in Japan that is dedicated to Buddha. The Japanese believe the souls of the dead reside here, and during the summer and autumn festivals many Japanese and tourists travel to this mountain. The Hakkōda Mountains in Aomori provide excellent hiking in the warmer seasons. However, the winter of 1902 proved disastrous to 199 of 210 soldiers who died during a military maneuver in the area in deep snow. Aomori Prefecture boasts a variety of festivals year round offering a unique look into northern Japan. Spring is the cherry blossom festival and is celebrated throughout Japan by gathering together to view the blooming cherry blossoms. Summer and Autumn hold many distinct festivals with bright lights, floats, dancing and music. Winter is centered on snow festivals where one can view ice sculptures and enjoy Japanese cuisine inside an ice hut. The Aomori prefectural symbol is a stylized map of the prefecture, showing the crown of Honshū: the Tsugaru, Natsudomari and Shimokita Peninsulas. According to Ken Cannon, there are three major dialects spoken in Japan; standard Japanese, Kansai dialect and Tohoku dialect. Tohoku dialect, or Tohoku-ben, is found in northern Japan and is spoken between farmers and country folks. This dialect is also referred to as "zuu zuu-ben" because when speaking the language the Japanese don't open up their mouths that much thus sounding slurred (i.e. zuu-buu-muu-zuu). There is a negative connotation that surrounds people that speak this dialect, labeling them as lazy country folks. Due to this negativity speakers of Tohoku-ben will hide their accents when speaking standard Japanese. There are dozens of versions of this Tohoku-ben, with two notably major ones in found in the Aomori Prefecture; Tsugaru-ben (津軽弁) and Nambu-ben (南部弁). The former is prevalent in the area around Hirosaki City, and the latter is heard in and around the city of Hachinohe. According to a study done by Hideki Tanaka, the "dz" and "s" consonants undergo palatalization in the Nambu dialect. There is also the dialect Shimokita-ben (下北弁), which was used in the early Russian–Japanese Dictionary made by a Japanese Russian man whose father came from the Shimokita Peninsula. It is a combination of Tsugaru-ben and Nambu-ben. ^ "General overview of area figures for Natural Parks by prefecture". ^ a b "Behold! Christ's grave in Shingo, Aomori Prefecture, The Japan Times". Retrieved 2012-06-06. ^ BBC News: "The Japanese Jesus trail" by Duncan Bartlett (9 September 2006) Retrieved 7 September 2010. ^ Jesus tomb' Aomori tourist draw, The Japan Times"'". Retrieved 2012-06-06. ^ "Web東奥・天地人20110201" (in Japanese). Toonippo. February 1, 2011. Archived from the original on 20 March 2011. Retrieved March 20, 2011. ^ "Matsuzaka". nikkansports.com. Retrieved 2008-05-23.